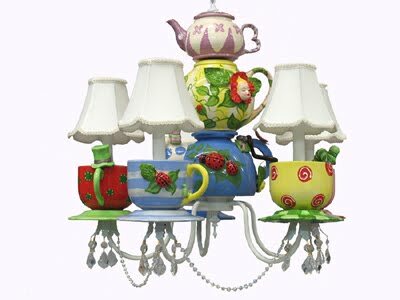 The perfect addition to any Alice in Wonderland theme would be a suited chandelier. Even if the theme is not all Alice in Wonderland! This chandelier is classic “ Alice in Wonderland”. The vintage storybook characters are brought to life in this wonderful functional piece of art. Do you remember the White Rabbit, the Mad Hatter, the Caterpillar, the grin of the Cheshire Cat, and finally Alice falling into the hole?, we have added them all. The Mad Tea Party is stacked in the center! Lots of hand made flowers, sculpted details and one of kind hand made singing flowers, vines, and butterflies. The colors are fabulous and this light is the top shelf of Whimsy and design! Light has iridescent beading and the prisms are true lead crystal for lots of sparkle and a rainbow of color. The shades are silk shantung. As always, this light is made just for you and includes shades and mounting hardware. This light will be your newest heirloom!!! Only available in five arms. 23”D X 21”H.